The Favourite scored a royal flush at the BAFTAs tonight – and Leading Actress winner Olivia Colman gave orders for her courtiers to "get p****d". The black comedy about Queen Anne was a standout success a the EE British Academy Film Awards winning seven awards and taking home the Outstanding British Film award. The film was nominated for 12 awards at the awards at London’s Royal Albert Hall, including for best film and outstanding British film. 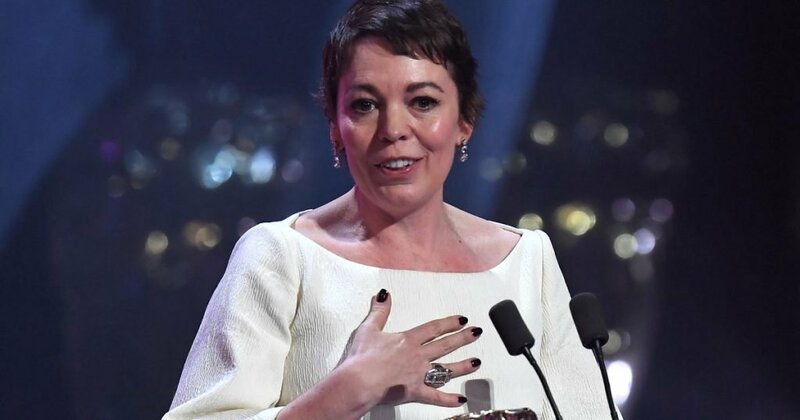 Olivia Colman received a standing ovation as she accepted the “extraordinary honour” of the Leading Actress award. “We’re gonna get so p****d later,” she giggled to applause. Olivia, who has already won a Golden Globe and Critic’s Choice award for her performance, fended off competition against SAG and Golden Globe winner Close for The Wife, as well as Lady Gaga for A Star Is Born, Melissa McCarthy for Can You Ever Forgive Me? and Viola Davis for Widows. Olivia, 45, added that her colleagues were the “best and coolest” co-stars on and off set. Emma has been nominated in the same category. Rachel, 48, also praised the “army of people that got this film made”. Backstage at the ceremony, Rachel joked about her raunchy scenes.“You want to know how I practised?” She said. “My mouth met hers. Our mouths opened. “There’s not really preparation involved in kissing someone. I don’t know of any. My character was in love with her and they had been lovers since they were teenagers. Netflix film Roma won four awards: Best Film , Director , Cinematography and Film Not in the English Language . Alfonso Cuarón won in each of these categories. The star of Bohemian Rhapsody, Rami Malik, took the Leading Actor award for his role as Queen star Freddie Mercury and called his win “truly extraordinary”. The 37-year-old added praise for the “greatest outsider of them all”, commending the “unwavering, unflinching in every which way… Freddie Mercury”. Host Joanna Lumley made a joke about the Oscars ceremony losing its host after homophobic Tweets made by Kevin Hart resurfaced. EE Rising Star award winner Letitia Wright, 25, admitted she had encountered depression in her field, encouraging young actors to “let their light shine”.